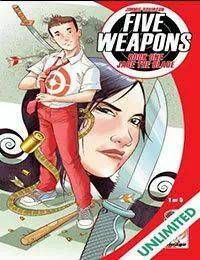 13-year-old Tyler finds himself in a specialized school where assassins send their kids for education and training in one of the five deadly weapons. Tyler doesnt have a weapon or any fighting skills, but he still plans to graduate by beating every weapon master in the school because he has a powerful ability that nobody can match: his razor-sharp mind! JIMMIE ROBINSON twists the insanity of BOMB QUEEN in a fun new series that will keep you guessing to the end. This series is rated T for Teen!